No, it's Harry Dewitt in 1903. Someone (presumably his wife) humorously inscribed "Ty Cobb" under this portrait in a family album. We can assume the album was prepared sometime later, as Ty Cobb wouldn't become a household name for a couple of years after 1903. I think we can tell who it was that probably took the picture, Pansy herself from the big brim hat shadow. That was quite the baseball mitt. Harry Dewitt, born in 1880, is first mentioned in the 9 January 1903 Hood River Glacier as recently coming from Portland. 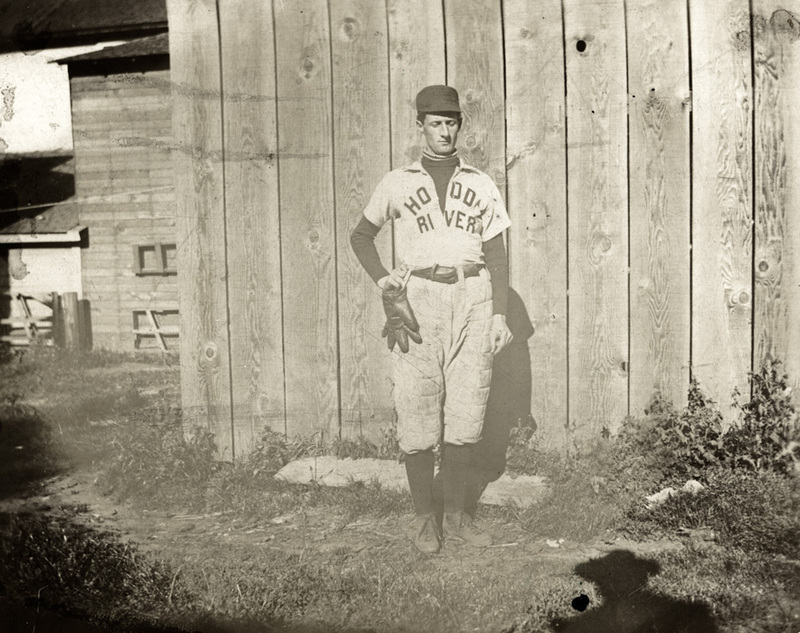 By April 1903 he was playing baseball, and was frequently mentioned that year as being a notable player. There is a photo here somewhere of Harry Dewitt in his auto shop with a broken hand or foot. That must have stifled his baseball game a bit. My dad said if you were a good baseball player you could get a job in a mill town, and play on their team. Is that padded pants, and if so, why? Glacier articles for 1903 list him as center field, right field, and umpire. L.E., the image you mentioned of Harry Dewitt with a broken foot is #1199. It was 1916, so I suspect his baseball career was over by then.